Abu Dhabi: A Portuguese resident living in Dubai became the latest Big Ticket winner on Monday and an instant millionaire thanks to his winning ticket, no. 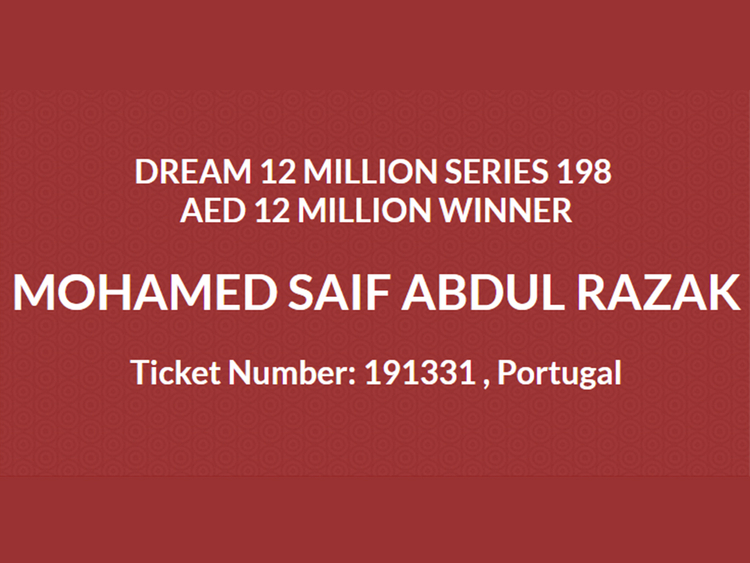 191331, which won him a not so small sum of Dh12 million. Mohammad Saif Abdul Razak was one of seven winners in the latest Big Ticket draw, with the other six winners – all from India – winning cash amounts of Dh50,000-Dh100,000. “That’s amazing, wow! That’s the best news!” said an ecstatic Razak when he received the morning call from the Big Ticket organisers telling him he had just won Dh12 million. It was his fourth attempt taking part in the Big Ticket. Held at the Abu Dhabi Airport every month, the Big Ticket Draw is the largest and longest running raffle draw in the UAE, with one raffle ticket coming at a cost of Dh500. Thanks to its large winning returns, the draw is one of the most popular in the country with both residents and people living abroad taking part. For those who were not so lucky this time around they will have a chance of winning a larger sum of money for next month’s Big Ticket – Dh 15million.